- Recall that we previously learned that four Ishtar Collective scientists, Maya, her wife Chioma Esi, Duane-McNiadh, and Dr. Shim, found a Vex of some kind and were studying it and eventually found that it was studying them as well. The Vex was running a perfect simulation of them and their (local?) world to the point it was predicting all of their real world actions. And it wasn't just simulating them, it was simulating a total of two hundred and twenty-seven copies of them! It appears that they managed to contact a Warmind and it intervened and somehow pulled all 227 copies of the scientists out of Vex control. Safe, the four real scientists and the 227 virtual ones all agreed that the virtual ones should venture back into the Vex Citadel's informational pathways to see what they could learn and achieve. Very notable here is that it was far too dangerous for humans to approach Vex structures. The cellular components could cause hallucinations while the informational elements could literally be Vex minds without substance ready to attack or infect anyone who came near. To combat this the scientists approached using "biomechanical proxy." That is, they used neural linked Exos with a Warmind as a firewall. The coast is different, beautiful, and unbroken and timeless. It teems with new life. Every big brain in the system has their sights set on the Academy. We were there for the Ahamkara, parasitic reptilian critters that appeared out of thin air. Inexplicable genome. New proteins. So much potential. And me? I'm there for her. Dr. Maya Sundaresh. She's poured into the research, on the brink of another breakthrough, focused on devouring every new data point. No. She doesn't know me at all, doesn't even recognize my face even though I've been here standing over her shoulders for months. I'm nothing more than a fixture, a required imposition. An unwanted necessity. I'm no egghead. Never was. Just like now, back then I was on a need-to-know basis, and the only thing I needed to know is that nothing and nobody gets through the door and past me without at least three layers of security clearance and a whole lot of muscle. Still. I think about saying something. Saying anything. In a second my mind rifles through a trillion possibilities. But she's already turned back to her work. I shuffle my feet, straighten my back, and return to mine. - 40+ years later, after the incident with the Vex, we find that Maya is now working in Lhasa Tibet. She is writing a letter to Chioma on Hyperion (the moon of Saturn?) apologizing for being so distant. The device she is working on is very interesting. It is a human built machine that mimics the Vex gateway system. Maya says she thinks of it as a "...mind-ship. Capable of displacing its payload across space and time." She tries it herself to apparently no ill effect. Or at least she doesn't mention any. The other scientists who enter it suffer from a variety of effects including thinking themselves as dead, horrible senses of deja vu, etc. Eventually, Maya retires from her position saying she is tired of being away from Chioma but she leaves her logs behind asking the others to continue them. She says that: "Maybe it’ll become a tradition. The gospel of our little cult." - The Future War Cult in the present day City that has a device when when entered causes a variety of strange sensations and causes a variety of strange and terrible visions. And they found records of the device "at a Golden Age laboratory in Tibet..." Also note that the Future War Cult's record keeping is the same "RECORD CHASM" format that Maya first used! - The last of the Future War Cult's records note that of 47 subjects sent into the device "eleven report timelines in which the Darkness has already prevailed, thirteen report timelines in which the City has fallen. Twenty-three babbled madness. Hopeless. Trapped." (That's all of them!) They also note that: "The human mind is too weak for it. Too weak to look into the Future, or to understand what it sees." - Interestingly, back in the Golden Age Maya Sundaresh agreed having said: "I think it’s clear that part of the problem is substrate. We need more than flesh and drug to survive this." (Drug referring to a drug that their unnamed supervising Warmind devised to try and protect them from the Device's effects.) Substrate seems to refer to one's body as Vex minds without physical forms existed "without a substrate." What would be better than a human mind? A better substrate? How about a nueral biomechanical proxy... Maya did seem to think they would get much more advanced in the future... and she's writing her log forty years from when she first thought about it. - Something else interesting: When Rasputin first detected the Darkness entering our system one of the ways he detected it was with a SxISR deepspace asset. Dr Sundaresh said of her "mind-ship"
The purpose of the system is intelligence, you see. It’s stenciled right on the hull: SxISR. Special asset. - Maya Sundaresh and her team built a device that allowed a payload to be displaced "across space and time." - The hallucinogenic and temporal effects put far too much strain on many, or most, or all of the subjects that tried to use it, and in the present day the Future War Cult found the same thing, but an Exo would be unaffected. Maya did say: "We need more than flesh and drug to survive this." - We know that Exos can be self contained individuals, but we also have record of biomechanical proxies being neural linked to their owner. And we now have a device that can displace a mind across space and time! 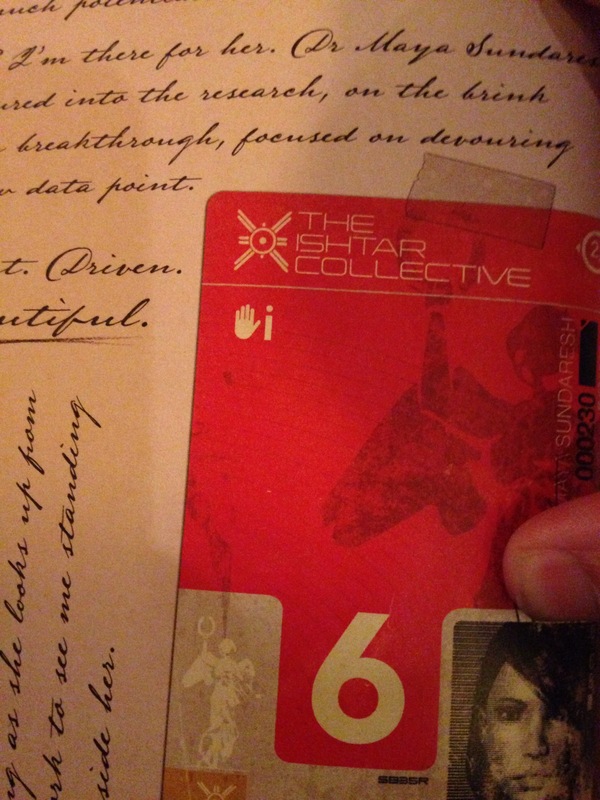 - Could the Exo Stranger be Maya Sundaresh operating from a "mind-ship" somewhere in our past or future? Her device had a hull implying it wasn't machinery in a lab but was actually a ship of some kind. And, What role might the Future War Cult, who has access to at least one such Device, be playing in the greater scheme of things?